Durham, Stacey. Dear Christian Parents: An Appeal for Homeschooling (published in 2011 by Create Space, 7290 Investment Dr., Suite B, North Charleston, SC 29418). To homeschool or not to homeschool? That is the question! Even though homeschooling is a rapidly growing phenomenon, many people who consider themselves Christians still strongly resist it. They may oppose those who do it, or if they accept others who do it, they would never dream of doing it themselves giving all kinds of arguments against it. What are the arguments for it? Even when I was growing up, forty to fifty years ago, I can remember hearing sermons and reading bulletin articles about “why are we losing our young people?” It has not gotten any better. Recent statistics show that some 88% of children raised in religious homes leave the church at age eighteen never to return. And the vast majority of these attend public schools. Are we so blind that we cannot see the connection? In fact, studies indicate that 85% of public school students from families professing Christianity do not hold a Biblical worldview, while 94% of homeschooled students say that their religious beliefs are basically the same as those of their parents. We talk about our “failing public schools,” and with regard to learning how to read, write, and do arithmetic, they have largely failed. But they have obviously been very successful in doing exactly what the progressives who hijacked them planned for them to do, and that is to become social experimental centers for indoctrination in worldliness and unbelief. 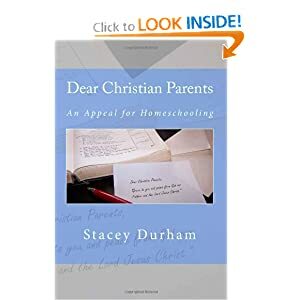 Author Stacey Durham, a homeschooling father and a gospel preacher working with the Creekview church of Christ in Gallatin, TN, has written a book consisting of 25 letters encouraging parents who are Christians to consider homeschooling. In his Preface, Durham points out that the majority of homeschooling books currently available are written for parents who have already decided to homeschool to help explain how to go about it. His book is for parents who don’t homeschool to provide information to help them make the best choices for their children’s education. Concerning his purpose, he says, “I want them to see the connection between a child’s education and his faithfulness to God throughout life. If this book can accomplish one thing, then I hope it is to prove to Christian parents that homeschooling is the most effective means of education by which they can pass their faith on to their children.” These 25 letters are divided into three sections: a Biblical appeal (chs. 1-6) based on scriptural teaching, an expanded appeal (chs. 7-16) showing the practical benefits of homeschooling, and the appeal applied (chs. 17-25) giving some foundational advice for Christian families who choose to homeschool. While Durham speaks primarily to those associated with churches of Christ, his arguments are applicable to all those who strongly believe the Bible and wish to raise godly families. Without going into great detail, I will tell you that Durham’s emphasis is that in order for education to be what God wants it to be, every subject must be taught from a Biblical worldview. His history about the noble beginning of the American educational system, the fall from its lofty goals, and the rise of homeschooling, though necessarily brief, is comprehensive and convincing, including his view that the modern return to home education may be providential for Christians. His distinction between “public schools” and “government schools” is one that I have been trying to make for years. There is useful information on the National Education Association, the UN Convention on the Rights of the Child, the “s” word (socialization), the charge of “sheltering” (“Nothing about homeschooling requires for children to be deprived of character-building experiences that are appropriate for them….You won’t shelter them from the world forever, but you will shelter them until they are ready”), even preparing for the dangers of college. This is one of the best pro-homeschooling books that I’ve read, and I’ve read a lot of good ones. Wow! I’m convinced—sign me up! Oh, yeah, we’ve been homeschooling for over fifteen years, so in my instance, he’s preaching to the choir—but we hope that others will listen and the choir will be enlarged. Let me remind you of the thesis. “My goal is to convince you to educate your children in the best way to cultivate faithfulness to God within them” (p. 10). “…I have all confidence to conclude that God-centered homeschooling fits each point of the Biblical pattern for children’s education” (p. 30). To which I can add only, “Amen!” Oh, by the way, this would be an excellent book for those doubting relatives and friends, especially if they’re members of the Lord’s church.